Company is coming to town for the Breeders’ Cup and you can be a part of making sure Lexington is ready. Three cleanup events will be held between 9 a.m. and noon on Saturday, Sept. 12. One is bound to be near you. Old Todds Road between Richmond Road and Palumbo Drive. The staging area for this event is at the Lowe’s store at 200 Old Todds Road. Man o’ War Boulevard. between Polo Club and Winchester Road. The staging area for this event is at the Lowe’s store in Hamburg at 2300 Grey Lag Way. Shillito Park. The staging area for this event is in front of the pool complex, located at 300 Reynolds Road. Participants are asked to register at www.KLBcleanups.eventbrite.com. Youth volunteers are encouraged to participate at the park location. The cleanups are sponsored by Keep Lexington Beautiful, an affiliate of Keep America Beautiful, with support from a Lowe’s Community Improvement Grant. Main Street and Newtown Pike. This fall, Lexington will host thousands of guests from all over the world as they make their way to Central Kentucky for the Breeders’ Cup. Keep Lexington Beautiful (KLB) is working with Lexington’s Division of Environmental Services (DES) to green up and clean up our community as we prepare for the spotlight. KLB has solicited corporate sponsors for the green up work that DES is carrying out. 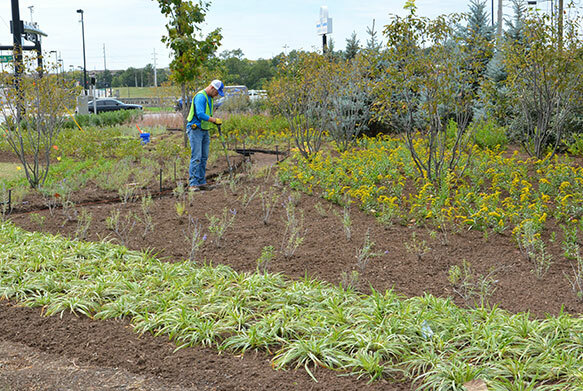 The green up projects are professionally designed wildflower beds along major transportation corridors leading into town that DES will install and maintain. KLB is also organizing a downtown clean up on Monday, October 26 from 1pm to 4pm. Bags, gloves, trash pickers, maps and other supplies will be available for volunteers at Phoenix Park and in front of the Kentucky Theatre. To tie into the Thriller Parade, volunteers are encouraged to come as zombie – though the living are certainly welcome to participate! For more information, visit the Facebook event page.